Song begins with 1 or 2 high “chip” notes, followed by faint grasshopper-like buzz. Description: Sexes similar. Flat-headed with short tail. Variable plumage. 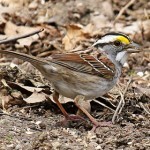 Most with dark brown crown with buffy median stripe; white eye ring; yellow-orange spot in front of eye. Back is chestnut-and-black striped; unstreaked buffy breast; paler unstreaked belly. Yellowish bend of wing not always visible. 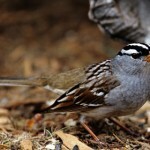 Eastern birds are somewhat darker and brighter; have redder breast. Juveniles have brown streaking on sides and breast. Behavior: Secretive, often drops into tall grass after flying short distance. Nests and feeds on ground. 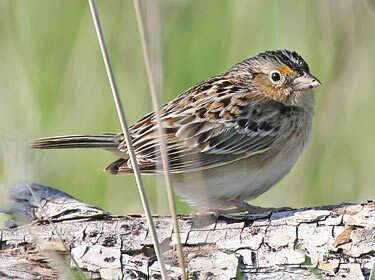 Habitat: Mixed-grass prairies, pastures, shortgrass prairies, and occasionally tallgrass prairies. Shrubby areas are avoided, but scattered trees are sometimes used for song perches. 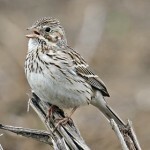 Fun Facts: When Grasshopper Sparrow’s prepare to feed their young grasshoppers, they shake off each leg one by one.